Note: Updated pictures are coming soon. 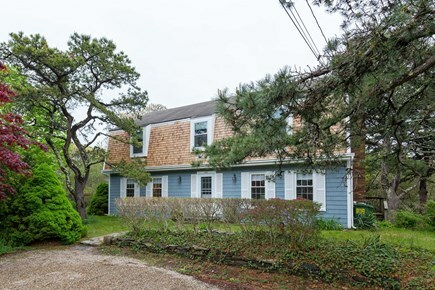 Plenty of room for the whole extended family in this newly furnished 5+ bedroom center hall Colonial. 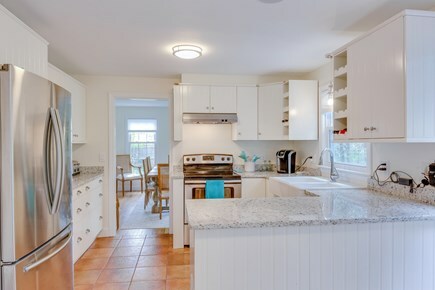 3 full baths plus an enclosed hot/cold outdoor shower, brand new granite countertop kitchen, large walk out deck, private yard and walking distance to the bay beach provide all the amenities you need for a great Cape vacation. Conveniently located, just a 6-7 minute walk to beautiful Campground Beach (voted one of the 10 best beaches on the Cape). Great beach for children and sunsets, especially at low tide when the light fills the tide pools! Bike rental is up the street so you can take an easy bike ride to Nauset and Lighthouse beaches and along the scenic Cape Cod Rail Trail (CCRT). Provincetown is 25 minutes and Orleans is 10 minutes by car. 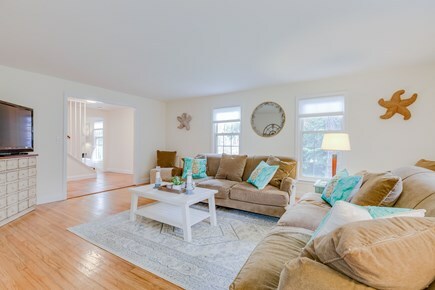 Light, bright and airy, the living room to the left of the main entrance is a comfortable lounge area leading to the dining and kitchen areas. The closeable large room to the right of the main entrance is where kids of any age can go to play board games or enjoy the flat screen 4K TV, cable and Netflix. This room also has a queen size sleeper sofa and easy access to the first floor full size bathroom. There is high speed internet coverage throughout the house. 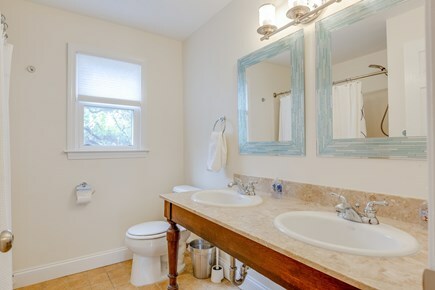 The bedrooms are all upstairs, master with en-suite, and second bathroom with double sinks off the roomy hallway. All bedrooms are newly renovated with all new furniture and mattresses. 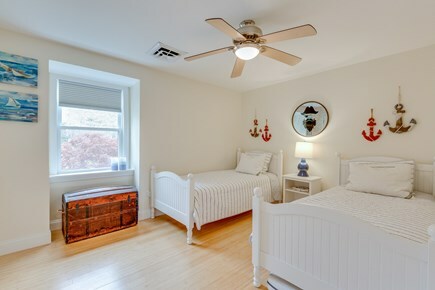 Every bedroom has high efficiency window AC unit. 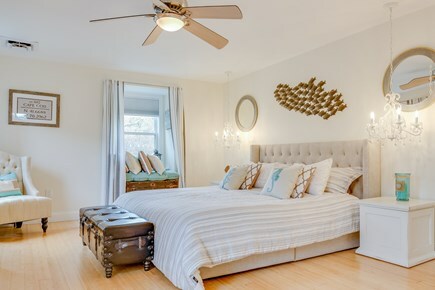 Ceiling fans in all bedrooms (except the smallest bedroom). The kitchen is brand new for the 2018 season and features stainless steel appliances, granite countertop and farmer's sink. It is equipped with everything you'll need to prepare meals at home. 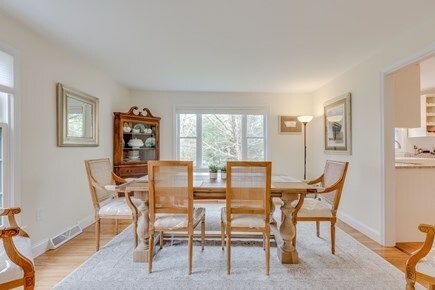 Pass through the patio doors to the large deck, surrounded with mature oaks and pines providing a beautiful shady and totally private backyard. Deck has patio furniture and new gas Weber grill. There are 5 dedicated parking shots. There is room for 3 cars in front of the house and an additional two on the far right of the Landing parking lot. Casual and tasteful modern and upscale furnishings make this relaxing retreat a home away from home. 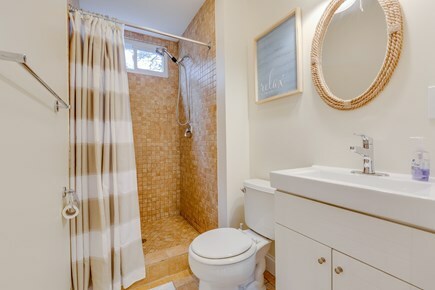 Although not fully handicapped accessible there is a bathroom and shower on the first floor. 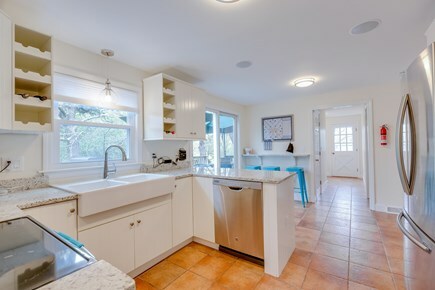 Lovely, remodeled beach home. Ideal for large family, easy walk to beach. Great location and caring homeowners. 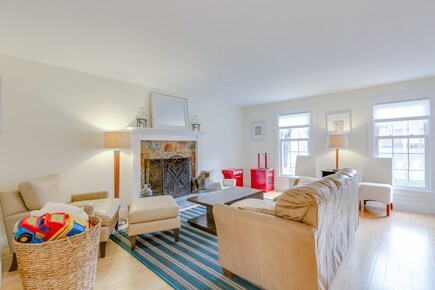 Spacious, comfortable rental that is great for a large family. Room for all with adequate bathrooms and showers. Everyone loved the outdoor shower. The walk to the beach was great for the children and we used our little red wagon for the toddlers. Seems like the owner thought of every amenity for a great family vacation. 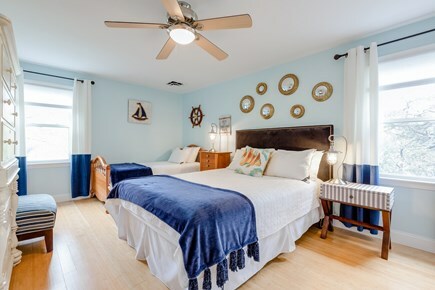 Our group of 8 adults and 4 kids were comfortably accommodated in the 5 bedrooms on the second floor, while we spent the waking hours in the living room, family room and on the deck. The backyard, accessed by a flight of stairs, had a rustic feel and on its many trees, a variety of birds were spotted throughout the day. We ate at the Friendly Fisherman, Vincent's, and Box Lunch, all within 10 minutes drive from the house. The kayaking (Cape Kayaking) from Hemenway Road was also easily accessible in 15 minutes. The grill in the backyard came in handy to cook some of the quahogs we had collected from the Nauset Marsh, while the rest we cooked with linguini in the amply large kitchen which was generously stocked with pots, pans, cutlery, plates, glasses and cups. This house was great. The furnishings, the appliances and the proximity to the beach were more than we could have hoped for! We had 3 families with 11 people and there was enough room so that we didn't get in each other's way. This house helped us to have the best family vacation ever! We've rented this home for several years and we love it. There's plenty of room for our 2 families (9 of us all together). The location is great; there's a convenience store right next door for newspapers, snacks, ice cream, etc. We love the short walk/bike ride to the beach. We also love that you can drive (or ride your bike) to Wellfleet, Eastham center, or Orleans without getting on route 6. Highly recommended! We are headed back for our 7th straight summer vacation in this wonderfully kept home that is spacious and comfortable. More than enough room for our family of 11 to spread out! The location to the beach is excellent, just a short walk to the end of the road. Also nice quite neighborhood for bike rides with the kids. There is a small store right next door which comes in handy if you need anything! We will be there in a few short weeks...can't wait!